My last full day in Perpignan was characterized by a somewhat renewed sense of energy and optimism. By then my body clock had gotten adjusted to the time difference and I had gained a pretty good sense of the layout of Perpignan. Plus, I recognized people–photographers that I knew who were just then arriving to the festival as well as some familiar faces from throughout my first day. I realized where I really needed to be was a venue I hadn't had time to get to, the Palais des Congrés. That's where all the photo agencies and wire services had set up booths in a very "trade expo" style, not unlike what you'd see at the Jacob Javitz Convention Center. And so I made that the main purpose of my last day at Visa. At 10 AM I was in line with a handful of other portfolio-carrying photographers outside the Palais. When they let us in I saw a bunch of people go straight to a table where they were passing out translation headsets. So I did just the same and caught the first half hour of a "Meet the Photographer" panel discussion with the photographer Cédric Gerbehaye. The presentation was all in French and it was pretty fascinating to listen to the broadcast of a person translating, in real time, the discussion that was taking place right in front of me. After a while I started to get a little antsy and decided to go see some of the agency folks. The first room that I encountered was something that I had not expected to find in all of Visa, a room filled with representatives from smaller "boutique" agencies. Collectives, really. I found that most of the photography being done by these groups came the closest to resembling my own work. It was all a lot more stylized, a lot more artsy than all of the "scorched-earth" photojournalism I had seen in all the exhibitions. I showed my work to a woman named Madalena, who works for the Kamera Photo collective in Lisbon, Portugal. There were about 20 total groups represented in the room and it was nice to just go around and collect some of the promotional pieces that were being handed out. Up in the main exposition hall were all the "big gun" agencies. AP, Getty, Corbis, AFP, Reuters, etc. It was not immediately clear to me who would be the best person to talk to. I wasn't so much expecting to nail down a firm contract with an agency as much as I simply wanted to begin a dialogue and get some feedback. 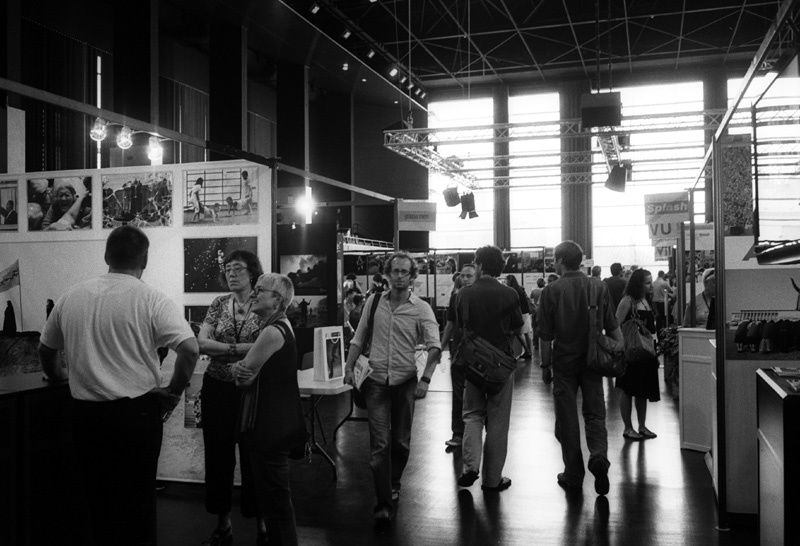 European Pressphoto Agency had a booth that seemed fairly inviting and so I started with them. I was told to come back later and ask for Cengiz Seren, EPA's Editor in Chief. When I returned he warmly welcomed me and offered me a seat. I was telling him about my negative portfolio review the previous day as he opened up my book and started to look through it. He hadn't gotten three pictures into it when he said "You did a fine thing coming here." He kept going back to one of my pictures in particular, the first print of the portfolio, of a canoodling couple in a bar booth. He said it made him think of a Neil Young song. I thought that was a cool thing to say. We chatted for about fifteen minutes, he gave me some great ideas to pursue and we made plans to stay in touch. He suggested I also talk to Guy Cooper at Corbis, who ended up being equally welcoming and generous with his time. As for Cooper's response to what my reviewer said the day before, he said "No, you have absolutely every right to be here." His take on New York City is that it's "enduringly fascinating to the rest of the world" but we also talked about the "endangered species" that is photography in the vein of Henri Cartier-Bresson, Robert Doisneau, etc. We talked a lot about model releases and the difficulty that can arise by not using them when a client wants to license an image. After I spoke with Cooper I went over to talk with Dominique Lecourt at Roger-Viollet, which I would describe as a vintage/boutique press agency that's been in existence since 1938. It's actually a reference historical archive and a lot of the imagery they deal with has been acquired from various collections. 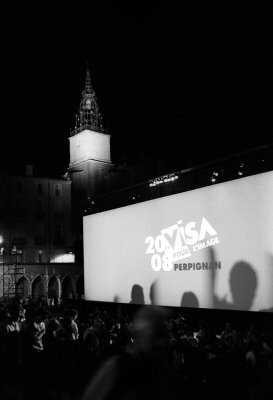 Because the agency is celebrating it's 70th anniversary this year, a lot of the highlights from its archive were shown at the previous night's projection at the Campo Santo. These images caught my eye because they were black and white portraits of jazz musicians in the 1940s, movie stars like Paul Newman and Marlon Brando back in the day, etc. A little later on I found myself chatting with Ferit Duzyol of Sipa. I told him how much I liked Göskin Sipahioglu's images at the Eglise des Dominicains and I was pleased to discover how Duzyol had had a hand in making that exhibition. That was pretty much it for one-on-one reviews with people from the big agencies. I actually tried a few others but was told to come back the next day, which is when I was supposed to be flying out. I went back down to the collectives booths and talked to a few more people there before setting out to get some lunch. It doesn't sound like much but this was all spread out over the course of about four hours. I also got a lengthy tutorial on Aperture and was able to hop online, check my email and reserve my seats for my next day's flight to Warsaw via London. After lunch I headed back to the Hotel Pams to see what all was going on there. I got a little turned around and had to resort to pulling out my map. A rail-thin fellow with a battered Leica asked me where I was going. When I told him he gestured to have me follow him because he ws going there as well. It wasn't until several days later that I realized it was Philip Blenkinsop, who ended up winning the Visa d'Or news prize. Outside the Pams was a very long line of people waiting to get registered for the festival. I could tell the festival was really starting to get underway. I crushed my way through the main entrance and as I was getting a cup of water I saw a familiar face approaching. It was Lance Miller, the Triumph motorcycle man from the night before. He had taken a look at my booklet of 12 photographs, had been impressed, and thought I'd be a good candidate for an interview for the Canon Professional Network website. His proposal to me was basically, "You're an up-and-coming photographer from New York, this is your first time in Perpignan, we'd like people to hear your story. This could also bring you some attention and possibly help your career out a bit." Soon he was on the phone with an associate, saying "I found the New York photographer, his name is Cary and I want to send him your way." An hour later I was to meet a film crew on the rooftop cafe of the Palais des Congrés. Sure enough, two men come walking in with a bunch of video gear. It was Sean Griffiths working the camera and a sound man, Murray Clarke, recording me as I talked with Evelien Kunst. 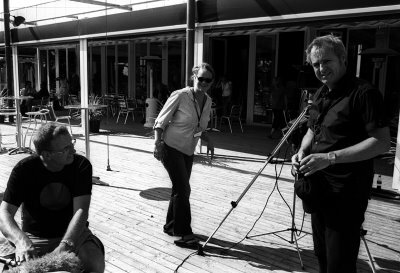 All three (below) were working as a crew for Red Dot, an Amsterdam-based production company working in Perpignan for Canon, trying to get a wide variety of festival attendees. I basically was asked to talk about my background, my current work in New York, my influences, my reason for coming to Perpignan, my plans for the future, etc. It was kind of a trippy being filmed as onlookers no doubt were thinking "Who on earth is that nobody they're filming over there?" They asked me to flip through my portfolio and talk about a few pictures in particular. In all, I spent about 45 minutes with them. We'll see if that footage ever sees the light of day. It's not important to me if it does or not. What is important is that I came to Perpignan totally alone and yet had managed to meet some great people and get some responses to my work. The entire experience had taken a complete 180-degree turnaround from 24 hours earlier. Soon it was the long hike back to my hotel to drop off my heavy portfolio and take a quick nap. After cleaning up a bit, it was back into the center of town for my final night's projection. I had stopped at a cafe for a quick bite to eat and watched as people were making their way to the Campo Santo. I finished eating quickly and rushed over. There were about 20 people ahead of me in line when they had to cut off entrance to the inside, apparently it had reached maximum occupancy. Some people were were visibly upset, whereas my mind was already starting to wander ahead to the next morning when I had to catch a 7:15 bus. I almost decided to go back to my hotel and get a good night's sleep. But I figured somewhere there was another entrance. So as best as I could I sort of hugged the perimeter of the Campo Santo, just trying to find access from another area. Sure enough I found a smaller doorway on the east side being guarded by a police officer. A few other people had gotten there just as I did and I snuck in with them, holding out my Visa Pour L'Image name tag. As far as I can tell, I was the very last person allowed into the projection that night. What followed was yet another amazing evening of dazzling visual choreography on the big screen. It was even better than the first night. The program closed with a spectacular medley of images commemorating the tumultuous year of 1968. Prague Spring, Tet Offensive, MLK and RFK assassinations, revolt in Paris, Black Panthers, you name it. It ended with the astoundingly apt "Earthrise" photograph from Apollo 8 lunar orbital mission on Christmas Eve of 1968. I was the first person in my section of the seats to begin clapping as the credits rolled. Back over at La Poste afterwards I had a few quick conversations over a few quick beers before I decided I better not risk oversleeping and missing my early bus. So I decided to leave while I was ahead. On my way out through the grand arch of Perpignan's iconic castillet I ran into none other than festival director Jean-Francois Leroy. I said to him exactly this, "I just want to say this is my first Perpignan and I did it all wrong. I have to leave first thing in the morning and was only able to stay two days. But can I just say–the nightly projections were amazing. Totally blown away by them. The sophistication of the sequencing, the music..." and right then a woman had come up and interrupted us, an old friend of his. It didn't matter, I wasn't going to wait around for them to finish talking. I sort of patted him on the back and continued on my way. A couple seconds later I heard him say "Thank You." I looked back and he was waving. I gave him a peace sign and walked on.